On the Taxonomy administration screen (accessible from the Taxonomies screen) you can manage your site's custom taxonomies. A maximum of 15 custom taxonomies can be created for your site. A controlled taxonomy is a taxonomy for which terms can only be added via the Taxonomy administration screen, i.e. only by Site Owners and Site Administrators. Unchecking the 'Controlled taxonomy?' option allows terms to be applied to the content and added to the taxonomy during page editing (in the Setup tab > 'Taxonomies' section). specify a new term for the taxonomy, which will be applied to the content and added to the terms list when the settings are saved. By comparison, the 'User role' taxonomy (2) is a controlled taxonomy. Terms listed for the taxonomy can be applied to the content but new terms can only be added on the 'List the terms for "[taxonomy name]"' screen (see section (3) 'Managing custom taxonomies'). Some taxonomies might only be relevant to content of one, two, or three types. 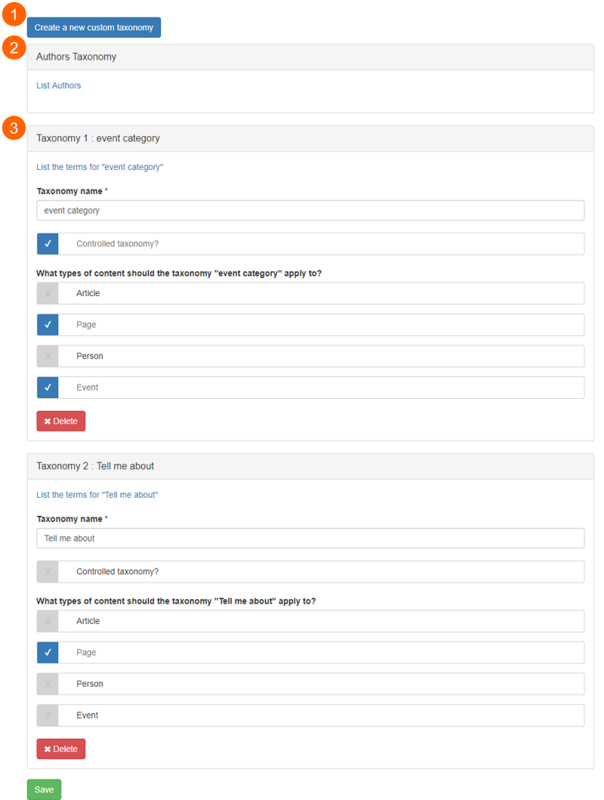 You can specify which content types the new taxonomy should apply to in the Create new custom taxonomy screen. These settings can be edited later on the Taxonomy administration screen. The Authors Taxonomy ((2) on the Taxonomy administration screenshot) is the only in-built taxonomy on a Mosaic site. The terms for this taxonomy are the names of authors of Article content on the site. The Authors Taxonomy only applies to Article content. Terms are automatically added to the taxonomy when content is created using the Article content type and an author name is added to the article (in the article's edit mode: Details tab > 'Taxonomies' > 'Author' input field). You can view the list of terms for a taxonomy by clicking the 'List the terms for "[taxonomy name]"" link on the Taxonomy administration screen. On the list of terms screen, the order of terms can be reorganised using the multidirectional arrows to the left of the terms. New terms can be added using the 'Add term' button. By clicking on the 'Add term' button, the screen pictured below will load. The term name (1) is mandatory; a description of the term is optional. Once the new term has been saved, the add term screen (above) will reload to allow another term to be added. To navigate back to the list of terms, click on the 'List' tab at the top of the add term screen. The current taxonomy details are the details defined on the Create new taxonomy screen (see section (1) 'Create a new custom taxonomy').